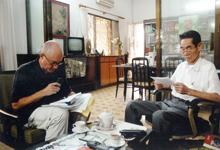 "Pham Xuan An was my colleague, teacher and friend -- and the person who saved my life in a long-ago war. I thought I knew him as well as any American, until I read Larry Berman's book. There were revelations for me on every page."